This entry was posted on Monday, May 16th, 2016 by Frances Ryan. Last week was the School of Computing PhD Conference, where all PhD students were expected to present their research. It was a long, busy day—especially as I was on the conference committee and was in charge of a couple of addresses (welcome and wrap-up stuff) as well as serving as replacement chair for the first-year presentations. And all of that public speaking was fine. But then I had to present my own third-year research towards the end of the day and nerves took over! It happens to me often, actually. I can easily get up in front of an audience and give a general talk or make impromptu addresses and comments. But presenting my research is different. Presenting my research means that people are expecting me to be an expert (or at least working towards expert status). And so I get panicked because I worry that I will be seen as a fraud, or that my years of speech therapy will fail me and I will stumble over the simplest of words—and people will laugh at me. 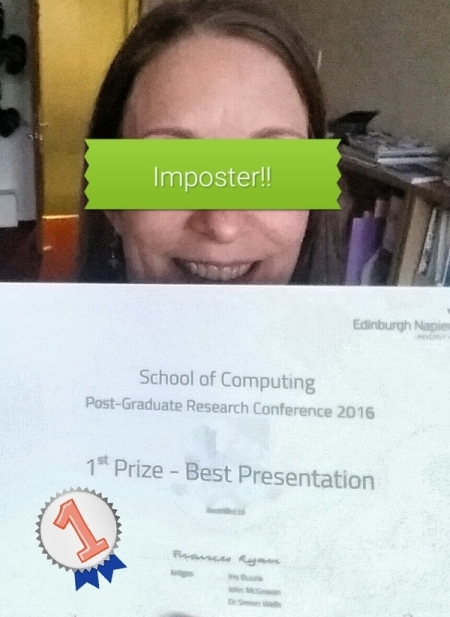 At the end, I felt OK… but I didn’t believe I gave a winning presentation. I did, however, feel that I might have had a shot at third place—maybe. But as it turns out, I won first place. But I honestly don’t believe I was the best choice. And I have to admit that I can’t fully enjoy the win because of it. The two second and third place winners were top-notch. They were confident and well spoken, and looked like pros as they delivered their presentations. I was certain that they would have been the first and second place winners. And whilst I was willing to consider the idea that I might be the third place winner, I knew there was another presenter who could have taken that spot. But that’s not what happened. Instead, I won. And now I find myself wondering why. Did I win because I was on the conference planning committee? Was it because I made a joke about planning to win first prize in every category—even those I wasn’t in? Did I win because the judges thought my ego needed it, even though my presentation didn’t? Or did they decide that the other two winners, whilst better, were better because they are also lecturers and therefore more experienced—and they wanted to give the prize to a “normal” PhD student rather than one who is already teaching in academia? Or maybe it was because the winner is going forward to present at the university-wide conference, and my “social media” topic was deemed the more appropriate topic for that venue. I don’t know why I won. And I don’t believe that I honestly, really, and completely deserved to win. I think that knowing there was some level of debate between the judges only fuels these wonderings. Because if I’d really been the best, it would have been an easy call. Of course, anyone who knows me knows that I really do like to win. But I only like to win when I really deserve it. I don’t want to win by cheating. I don’t want to win by special favour. And I don’t want to win by political wrangling. I just want to win because I was the best. Only I wasn’t. This isn’t meant to read as my doubting myself. Because having watched the other presentations I do believe I was good; I know I was one of the best. I just don’t think I was truly the best. I have a couple of presentations coming up in June now. One for a conference I was invited to speak at and one as a representative of the School of Computing at the university-wide research conference. So that means I have a couple of weeks to regain my confidence. Because this specific first-place win has brought me down a bit as I’m now questioning past wins, too. Hmm. So debate between the judges suggests you weren’t the best? It certainly suggests you won on merit - maybe not the merits that you were using to judge by, but you weren’t supposed to be doing the judging this time. Learn from the elements of other folks’ presentations that you liked, and do them and the School of Computing proud!